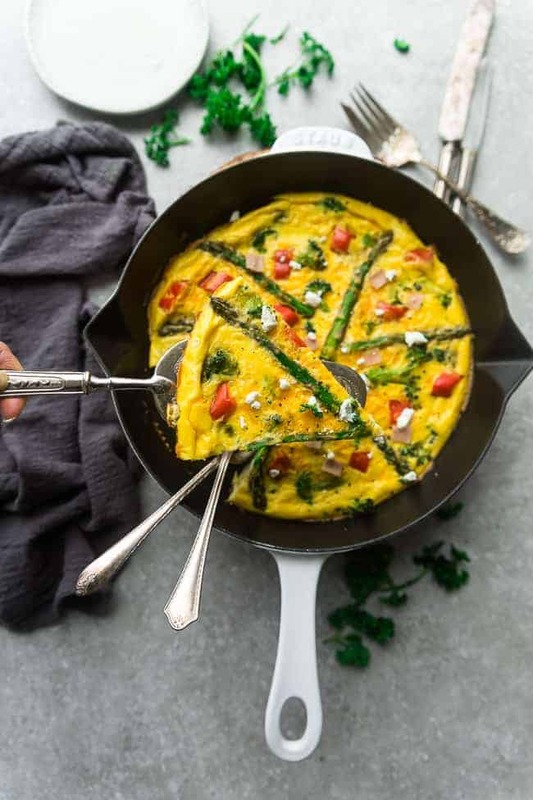 Keto Frittata is an easy make ahead low carb recipe perfect for a spring breakfast, brunch or dinner. It’s a gluten free protein packed recipe made with asparagus, diced ham, bell peppers, cheddar and goat cheese. Pin here for later and follow my boards for more breakfast recipes. Eggs for breakfast happen a lot around here. We usually rotate between these breakfast egg muffins, egg casserole, hard boiled eggs, baked eggs and frittatas. 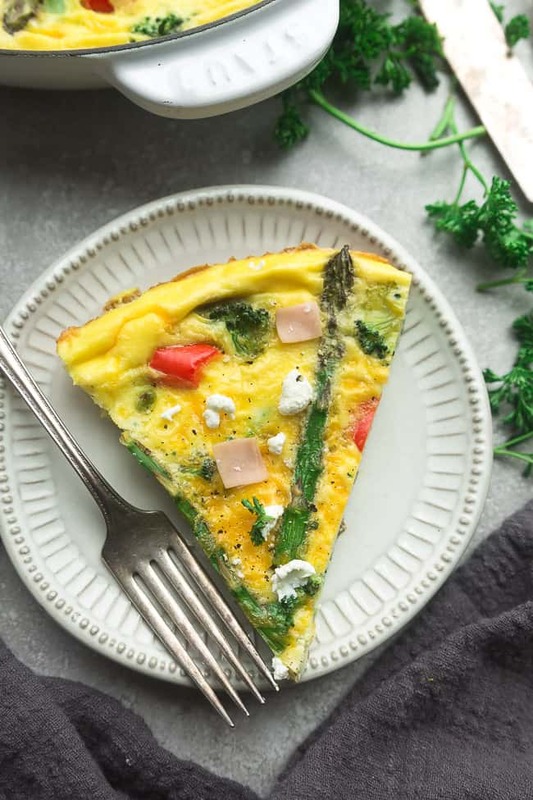 This keto breakfast frittata is packed with protein and includes our favorite spring vegetables. Asparagus is one of my favorite spring veggies and it goes so well with goat cheese, broccoli, ham and bell peppers. The best part is that you can easily customize the add-ins with whatever low carb veggies you have on hand. 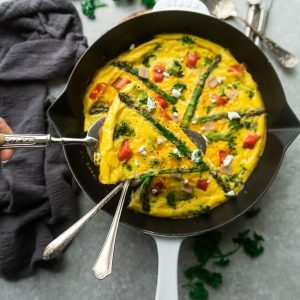 If you’re not a fan of goat cheese or want to make a dairy free frittata, feel free to leave it out. Another great thing about frittatas is you can make them ahead the night before when you have overnight guests for Mother’s Day, Easter or any weekend brunch. They make an easy, quick and delicious meal and are perfect for busy mornings. Do you ever crave eggs for breakfast but want something more filling than scrambled eggs? 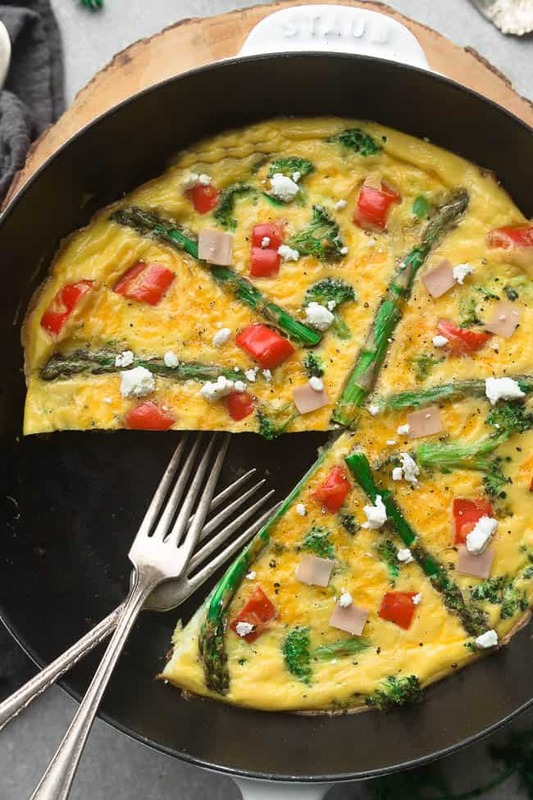 Frittatas and omelettes make a delicious option. 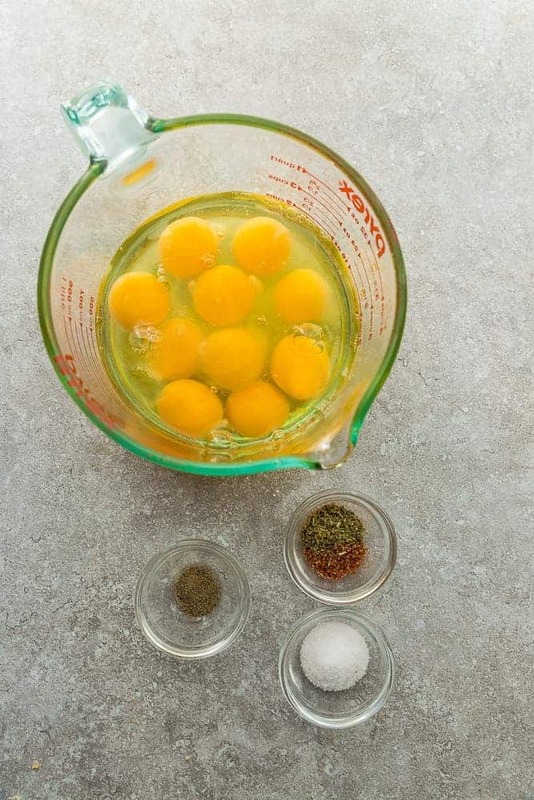 To make a low carb frittata, you start by beating the eggs and cooking them in a hot skillet for a few minutes until the outer edges are set. Add the filling ingredients and transfer the pan to the oven where the eggs finish cooking. Add the onion, asparagus, bell peppers and ham. Saute for 2-3 minutes. Meanwhile, whisk the eggs with heavy cream and season with salt, black pepper and garlic powder. Stir half of the cheddar cheese. Spread the asparagus into an even layer. Pour egg mixture into the skillet over the asparagus and sprinkle with crumbled goat cheese. Transfer the frittata into the oven until just set. The great thing about frittatas is that they are perfect for using up leftover vegetables and protein from your fridge. Add some zucchini, kale or spinach to keep this frittata low carb. Instead of ham, you can use prosciutto, sausage, cooked chicken or turkey instead. 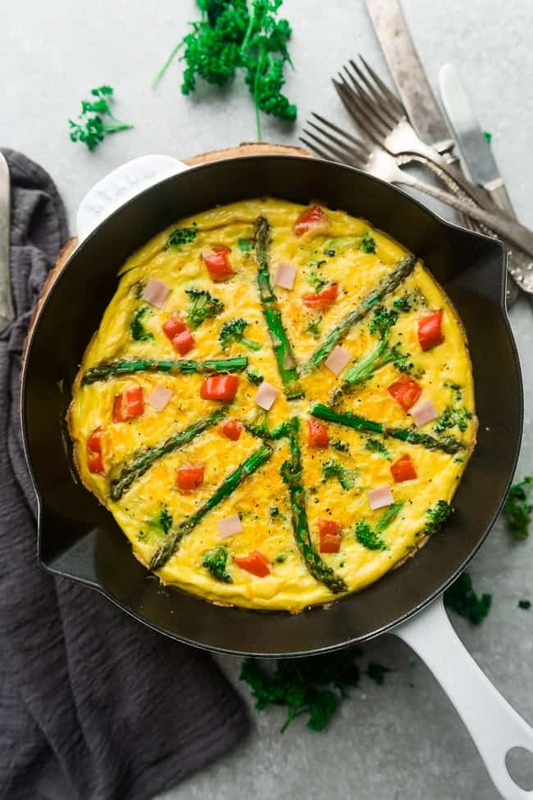 Keto Frittata is an easy make ahead low carb recipe perfect for a spring breakfast, brunch or dinner. It's a gluten free protein packed recipe made with asparagus, diced ham, bell peppers, cheddar and goat cheese. In a 10″ nonstick skillet over medium heat, heat the oil or butter and add the onions, asparagus, broccoli and bell peppers. Cook for 2-3 minutes, until just becoming tender. Season with a pinch of salt and pepper. Meanwhile, whisk the eggs with cream and season with additional salt and pepper. Stir in the garlic powder and cheddar cheese. 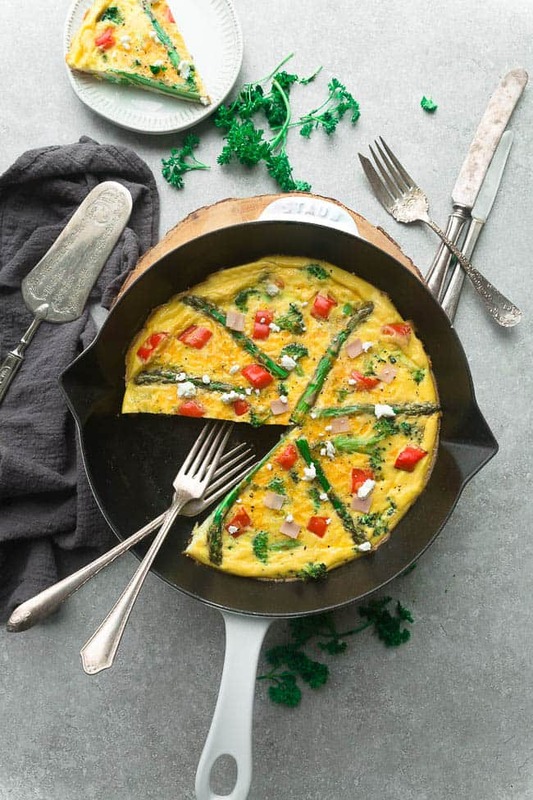 Pour the eggs into the same pan with the asparagus, and top with crumbled goat cheese.